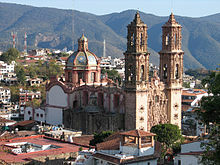 Taxco de Alarcónis heavily associated with silver, both with the mining of it and other metals and for the crafting of it into jewelry, silverware and other items. Today, mining is no longer a mainstay of the city's economy. The city's reputation for silverwork, along with its picturesque homes and surrounding landscapes, have made tourism the main economic activity. This article uses material from the Wikipedia article "Taxco", which is released under the Creative Commons Attribution-Share-Alike 3.0 License.